Angie, you and Ken made the tour very special. Thank you! 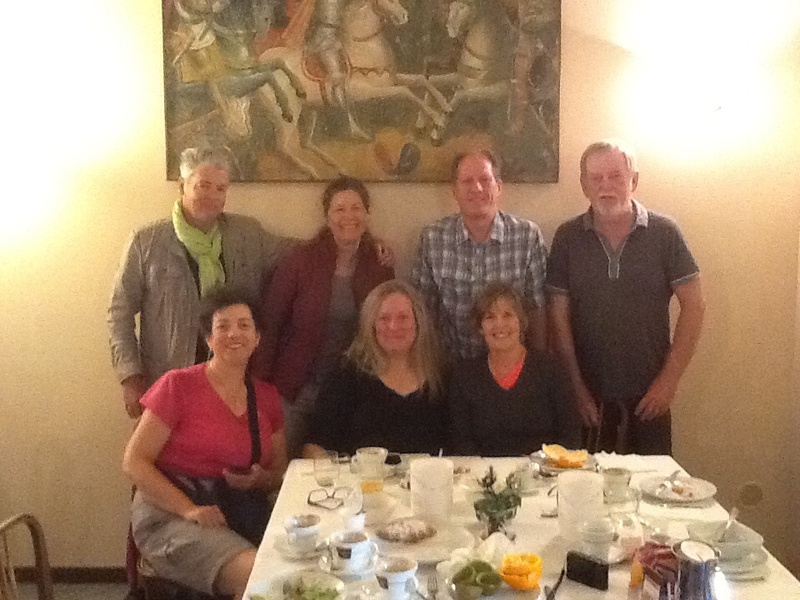 What a grand fun time all of us pilgrims had on the Via de Francesco walking tour organised by Bill and Jen. And it was so good that yesterday morning it was very hard to say farewell to each other. Somehow or other the toughness of going up and up and then down and down has disappeared. But I feel that the toughness of saying goodbye might be staying with me for a little while yet. It was a drawn out good-bye, we had to make the most of it starting with our last brekkie together. What a better way to mark the occasion than to pose for a group photo in front of our table. We sat around many tables over the last two weeks sharing food, drinking wine, chatting and laughing.